Having an old desktop that doesn’t perform can take the wind out of your sails especially while working. Every extra minute it takes to load software or play a video is excruciating, and a constant subtle reminder to upgrade. I know that because I’ve owned an old PC before. The Dell Inspiron i3650-3756SLV packs blazing speed and premium components to solve that. PC gaming manufacturers have stolen the thunder out of ordinary desktops with their savvy marketing stunts. Today all you hear about is gaming consoles and frame rates which is great for gaming enthusiasts, but not so appealing for ordinary folk with no interest in gaming. As we all know not every user is looking for a gaming desktop. Sometimes, all you need is a desktop to get you by… to get the job done. A desktop that can browse the web, handle random office tasks and run other run-to-the-mill tasks without breaking a sweat. Of course, that’s not forgetting a substantial amount of storage space and a decent amount of memory to handle multitasking. The Dell Inspiron i3650-3756SLV is a great prebuilt alternative for users with such needs and particularly users who might not know how to build one on their own. The Dell Inspiron i3650-3756SLV is not nearly as entertaining as a gaming rig, but it comes with a decent amount of high-end components and budget-friendly price. Plus, it sports a great blend of professional aesthetics, casual look, and plenty of leg room for future upgrades. For this PC, Dell focused more on the performance side of things than design and aesthetics. Nothing about the Dell Inspiron i3650-3756SLV Desktop screams out loud; gamer or otherwise. It comes outfitted in a traditional black polished chassis with silver edges and cues from the best in professional looking desktops. The tower blends perfectly among other business desktops in an office setting and should seamlessly transition from your office and home desk space. It measures 11.13 x 6.06 x 13.78 inches which goes to show it’s an average size desktop that should work well towards uncluttering your desk space. 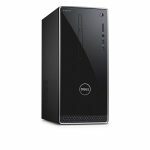 In many respects, the Dell Inspiron i3650-3756SLV reminds us of the Lenovo ThinkCentre M900; an excellent desktop tower made for business use. They share a similar modest design and both have more of their focus on performance rather than design. There are a number of ports available for use on the Dell Inspiron i3650-3756SLV Desktop. The front houses two USB 3.0 ports at the front for proximity. There is also a microSD card slot and audio jack gracing the front. The rear also promises a healthier port system owing to the 4 USB 2.0 ports, VGA, HDMI and Ethernet port available there. The USB 2,0 ports should come in handy if you’ve got a lot of peripherals to connect to. The configuration we tested comes with a 6th Generation Intel Core i5-6400 Processor, 12GB DDR3L RAM, 1TB 7200RPM storage and Intel HD graphics. The Intel Core i5-6400 processor is a quad-core processor from the Skylake architecture family, operating with eight threads. It runs on a base clock speed of 2.7GHz and a top turbo of 3.4GHz. It is not made for overclocking so certain tasks such as intensive AAA gaming can’t be achieved here. But that shouldn’t worry you too much if you’re not a gamer. That’s because it has what it takes to power through ordinary tasks such as music and video editing. Another positive attribute is its low power consumption (TDP of 65W), and as a result low heat emission. You can use a stock cooler to keep temperatures on the down low if you’re planning to put metal to the floor with it. While this CPU is obviously a tad slower than Intel’s 7th Generation processors, it should get the job done. Overall, the Core i5-6400 feels snappy in most run-to-the-mill tasks you throw at it. It shines while performing Windows tasks, for instance, web browsing with a dozen tabs open and running office apps and software. Other intensive tasks such as gaming and more graphics intensive software like CAD put a strain on it, ideally forcing the fans to spin wildly and bit loudly too. On the other hand, the multitasking ability is also attributed to the 12GB DDR3L memory on board for this configuration. 12GB is pretty sufficient for most tasks but you can opt to go for up to 16GB memory in the future. On the storage front, I had no issue with the 1TB 7200RPM storage. It is the lack of a solid state drive that simply bothered me. We all know budget machine are studies of compromise, forcing you to choose which components you are comfortable trading off or sacrificing. And because of that, I understand that Dell had to make this tradeoff in order to cut down on costs and eventually pricing. However, I strongly recommend adding a solid state drive to improve performance, cut down boot times and software load times. If you’re one to worry about performance and speed, this is your best bet for improving these. If your primary interest is gaming, this PC might not be for you. It hoards a bunch of tradeoffs that should push the gaming life out of a desktop. However, if you’re a compulsive internet user with predilections to YouTube, Facebook, Twitter, and other social media platforms, then you’ve got a better chance here. The Dell Inspiron i3650-3756SLV Desktop does exceptionally well online and can handle itself remarkably with Windows apps, other daily office/ home tasks such as music and video editing. We recommend it for the users looking for a budget-friendly machine with more emphasis on raw performance rather than design.